MedsCK has an in-built appointment book for scheduling and managing MedsChecks so you don't need a separate application for tracking your reviews. MedsCK is self-contained and includes everything you require to complete a MedsCheck, from appointment to claiming. Click on any time slot to schedule a MedsCK appointment. Click and drag to change appointments to a new time slot. 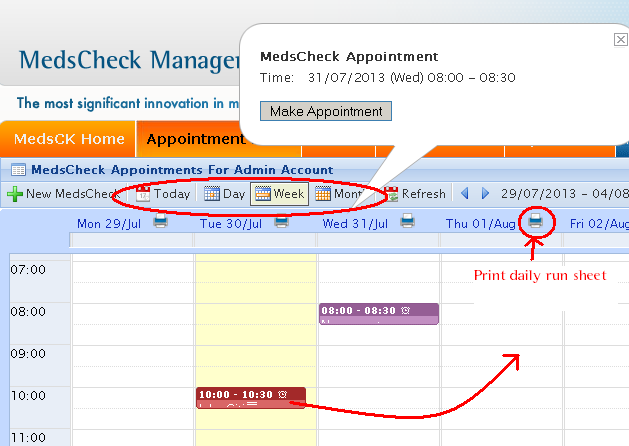 Click on an existing appointment to view patient details and Edit, Delete or mark as No Show. Click on New MedsCheck button to perform a MedsCK for walk-ins. View appointments by Day, Week or Month to get a snapshot of your MedsCK schedule. Manage your reviews by printing daily run sheets for any day of the week. Colour coding to mark appointments as Open (red), Completed (grey) and No Shows (green).